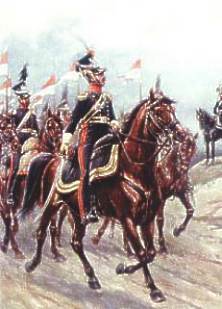 Uhlans means lancers armed with lance of the length 2,75m, curved sables and pistols. In Army of Duchy of Warsaw there existed ten uhlans regiments. Regiments 2nd, 3rd and 6th were formed in years 1806-1807. During Galician campaign and after its finishing there were formed also regiments No. 7th, 8th, 9th, 11th, 12th, 15th and 16th. moreover during campaign of 1812 there were also formed regiments 17th, 18th, 19th, 20th and 21st. Uniforms of uhlans were different and only some regiments wore on the caps the shields with the "half of the sun". There had not been also decorated the caps with the plumes and rosettes. Flags at the lances were usually either red and white or red and blue in different variations.